The new friend that paced your daily life! The GOO Activ bracelet has many features: heart rate, blood pressure, number of steps, distance, calories, smartphone notifications ... A concentrate of technology you will not be able to do without! With its light weight of 21.5g, the GOO Activ will be quickly forgotten on your wrist. With a simple gesture, the screen turns on automatically to display the date and time. The bracelet, available in three colors (white, black, blue) is detachable and recharges very quickly thanks to the supplied USB cable. The load can last up to 5 days in normal use. Your health is invaluable. Measure your activities and set daily goals with the many features. Move with GOO Activ! Your GOO Activ pair with your smartphone in bluetooth and automatically synchronizes with the H Band application. 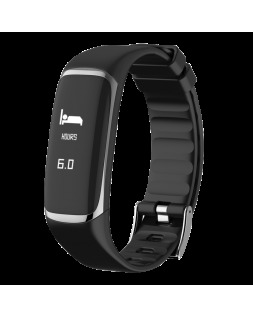 H Band analyzes your sleep, your movements, your heart rate and your blood pressure to monitor your health on a daily basis. Starting signal! Start your jogging and follow your progress with the display of data and your way with the GPS of the phone. Set your phone's notifications to display on the GOO Activ. Be informed of your vibration calls and program an alarm.